Aberdeen is a recognized center of regional and federal government offices, education, healthcare, financial services, retailers, wholesale and manufacturing. It is a place where entrepreneurs can prosper and solid values survive. Brown County is also one of the most productive agricultural counties in South Dakota. In recent years, the area has been transformed from a trade center serving family farms to a regional agricultural center with ever-expanding grain terminals, processing facilities, and ethanol plants. Great strides in telecommunications distinguish Aberdeen. Not only has the city built a nationally recognized telecommunications infrastructure, it also boasts a "smart center" that houses a business incubator, video conferencing facilities and classrooms. Information service industries in the areas of student loans, collection, financial services, insurance and printing and lodging reservations thrive here. Aberdeen is also the birthplace of many corporate headquarters and franchises including: Super 8 Motels, Expetec, Wooden Mallet, Midstates Printing, Dacotah Bank, Hub City, Inc., Wyndham World Wide, Cabinets Universal, Primrose Retirement Communities, Kitchen Tune-Up and more. The city also hosts local, regional and national companies such as Wells Fargo Auto Finance, 3M Company, BAE Systems, Twin City Fan, and most recently Molded Fiber Glass Companies. Families enjoy our wonderful schools and parks. Residents enjoy the many recreational offerings, as well as ample hunting and fishing opportunities. A safe environment and friendly neighbors make it a perfect place to create the life you want. We are a progressive area with Midwestern hospitality. 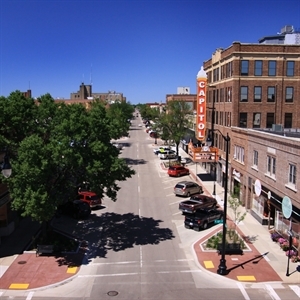 In 2015, Aberdeen has been named one of the Top 100 Best Places to Live (Livability), #6 for best places to retire in South Dakota (SmartAsset), and one of Best Small Cities in America (NerdWallet). Hunting, fishing, camping, boating, cross-country skiing, bird watching, biking, snowmobiling, and many organized team sports keep active Aberdonians outdoors through all four seasons. There are superb public and private golf courses. Sand Lake National Wildlife Refuge, a short drive from the city, is a nationally recognized wildlife sanctuary. Pheasant hunting draws outdoorsmen from across the country each fall, and duck and goose hunters set decoys on the many small lakes and marshes that dot the fabled "prairie pothole country." Some of the finest walleye fishing on earth can be found only 90 miles away on the Missouri River's giant Lake Oahe. Scenic and sizeable lakes are near at hand, with Mina and Richmond Lakes only minutes away from the city, and the wet, wooded Glacier Lakes region is an easy, hour-long drive away in the rolling hills to the northeast. Aberdeen has an enviable park system, highlighted by Wylie Park, with its swimming lake, water slide, go-carts, mini-golf, campsites, and bike trails. Adults and children alike are enchanted by Storybook Land and the Land of Oz, adjacent to Wylie Park. At Storybook Land, larger-than-life interactive storybook characters provide an adventure in imagination and memory. You can ride a small-scale train to tour the park or stroll lovely, landscaped walkways. Sports fans pack the Brown County Speedway to watch auto racing or wager on Thoroughbred horses galloping wire-to-wire. Northern State University fans cheer the winning wolves of Northern State University in exciting NCAA Division II sporting events in the impressive Barnett Center, where dynasties in both the men's and women's programs draw huge, noisy crowds. Presentation College is building its own competitive sports programs with football and soccer. Youth and adult sports are enthusiastically followed and well supported in Aberdeen. In addition to activities such as basketball and football, the community offers youth programs in golf, hockey, BMX biking, baseball, dance, softball, and soccer. A new soccer complex adds a dozen regulation size fields to existing fields. Hockey is played indoors in the new Odde Ice Arena and Aberdeen is home to the Aberdeen Wings, our North American Hockey League Team. Tennis players enjoy more courts per capita than any other community in the state. Each summer the best party and family celebration in South Dakota takes place on the outskirts of Aberdeen, when the Brown County Fair is held at the county fairgrounds. From theater productions to painting, sculpture, ceramics, and everything in between, artists of all kinds and ages live and create in Aberdeen. Local commercial galleries offer original art, and numerous other galleries display the work of regional and national artists. Native American artists are also a vital part of the arts community. The city offers abundant arts programs for adults and youth through the parks and recreation department as well as the Aberdeen Area Arts Council, Northern State University, Presentation College and other organizations. Aberdeen Recreational and Cultural Center (ARCC) is a multi-faceted arts and community center that provides programming in visual arts, dance, music, theater, athletics, meetings and special interest areas. The Gallery offers a multitude of art forms, media and original artwork for sale from local and regional artists. Summertime brings Arts-In-The-Park, a weekend of entertainment and artists selling their work in outdoor booths. In winter there's Winterfest, an indoor festival featuring artwork for sale. Both events are sponsored by the Aberdeen Area Arts Council. Come see and hear the story that the prairie has to tell at the Dacotah Prairie Museum. Step back in time to witness the people, progress and natural history that has influenced the development of our region. The museum is home to the Hatterscheidt Wildlife Gallery, which features more than 40 mounted specimens in a full scale mural. The Zietlow Telephone Exhibit is the largest collection of independent telephone and telegraph company materials in the US.The Dacotah Prairie Museum also features several excellent galleries hosting touring exhibits and artist presentations. Near the James River is The Granary, a unique cultural center with a campus that includes interesting art galleries housed in a renovated granary, a large gazebo, a relocated historic, town hall, and park-like grounds. The importance of theater is reflected in Aberdeen’s Historic Capitol Theater, the charming home of the local Aberdeen community theater group. Actors and spectators alike have ample opportunities to participate in or witness ambitious productions that are held throughout the year. The theater opened in 1927 and is on the national historical register. The theater includes a sixty-foot tall marquee and six french era-deco chandeliers. Theatrical options for children are also abundant through community theater, touring children's troupes, and outdoor summertime performances at Storybook Land Theater. Aberdeen's Community Concert Association brings nationally recognized musicians to the city. Northern State University frequently offers performances by its talented faculty and students as well as sponsoring special appearances by well-known musicians. Christmas music lovers look forward to the annual "Living Christmas Tree" concerts. Weekly performances by the community band are held during the summer in Melgaard Park. The City of Aberdeen manages Ride Line, Aberdeen's public transportation system which provides bus rides for people in Aberdeen, including citizens residing within 2.5 miles of the city limits. Demand Bus Service offers a fixed route fare of $2.00 for persons with disabilities, Monday through Friday, from 7:00 am to 7:00 pm. About 80% of buses are wheelchair accessible. Paratransit Services are available to the general public for persons with disabilities at the rate of $2.00 per fare, and feature curb-to-curb service. Special certifications are not required for visitors with disabilities. Aberdeen is a key regional healthcare provider with caring, skilled, and experienced professionals using some of the most advanced medical equipment available. People come from miles around to take advantage of the wonderful services found here. We offer a full complement of medical facilities and health professionals including two hospitals (Avera St. Luke’s and Sanford Health), a specialty medical center, Orthopedic Center of the Dakotas and the Coach Don & Carmen Meyer Center of Excellence Avera Cancer Institute. Aberdeen also offers emergency helicopter transport and 24-hour emergency room physician care as well as fast-care clinics. Aberdeen’s physicians represent 34 different specialties such as neurosurgery, oncology, orthopedics, and cardiology, just to name a few. Additional healthcare services include orthodontics, dentists, chiropractors, psychologists, pain management optometrists, addiction counselors, a full array of therapists, and more. Retirement homes, assisted living facilities, and specialty apartments meet the needs of the elderly. Jan 0.6 F° 11.0 F° 21.4 F° 0.5 "
Feb 8.8 F° 18.6 F° 28.5 F° 0.5 "
Mar 21.2 F° 30.7 F° 40.2 F° 1.3 "
Apr 33.4 F° 45.4 F° 57.4 F° 1.8 "
May 45.6 F° 57.9 F° 70.2 F° 2.7 "
Jun 54.8 F° 66.8 F° 78.7 F° 3.5 "
Jul 59.7 F° 72.2 F° 84.7 F° 2.9 "
Aug 57.4 F° 70.5 F° 83.5 F° 2.4 "
Sep 46.5 F° 59.8 F° 73.0 F° 1.8 "
Oct 34.4 F° 46.8 F° 59.2 F° 1.6 "
Nov 19.7 F° 29.3 F° 38.8 F° 0.8 "
Dec 6.3 F° 16.0 F° 25.7 F° 0.4 "
Aberdeen, South Dakota boasts enjoyment of all four seasons with many activities to keep its residents busy. Summers are beautiful, with an average July high temperature of 71.3 degrees. Take advantage of the sunshine by visiting our nearby lakes for water recreation and fishing, Wylie Park and Storybook Land for family activities like mini golf, the Land of Oz Carousel and the Wylie Park Zoo, or stop by the Aberdeen Aquatic Center for swimming in the lap pool or floating in the lazy river. Fall is a wonderful time of year with the changing of the leaves (check out the gorgeous display at nearby Sica Hollow State Park) and take advantage of the mild fall temps during hunting season for deer, pheasants, ducks, geese and more. Winter brings a blanket of snow and many winter events such as Winterfest (a craft expo), Wings hockey games, and ice skating. Spring is a perfect time to enjoy our numerous city parks and Parks and Recreation classes including pottery, painting and more. Condos Over 50 Communities Aberdeen has many options when it comes to housing. We have single family homes for sale, an abundance of rental units (many built within the last five years), assisted living facilities and nursing homes, and condominiums. Aberdeen’s bike path system is woven through our community to connect residents to parks, shopping and services. You can choose from historic homes in the Highlands or Hagerty/Lloyd Historic Districts, or purchase a condo conveniently located next to Rolling Hills Golf Club and Lee Park Golf Course. Downtown loft living is also an option for those who like to be close restaurants, theater, film and shopping. Home care Senior center Visiting nurses The Aberdeen Area Senior Center, a United Way agency, provides its members ages 50 years and older with various social, informational, and health care programs. Seniors can participate in a variety of programs, including cards, pool, Bingo, Scrabble, holiday parties, exercise classes, day trips, and health care/social service programs. Available special interest and focus groups include Young at Heart Reading Club, Penning the Past Writing Club, Veteran’s Coffee Hour, Dakota Sunshine Singers, Memory Loss Support Group, and Senior Center Line Dancers. An exercise room and computer lab are available to all members. Health and fitness activities such as an exercise class, Wii Bowling and health and wellness seminars and programs are offered. Experience Works offers employment training services through the Senior Community Service Employment Program to low-income older workers in Aberdeen. Experience Works partners with local 501 (c)(3) not-for-profit agencies in each of the counties they serve as training sites for participants. Experience Works also actively collaborates with local and public employers to create permanent employment opportunities for older workers who want to re-enter the workforce. RSVP is America's largest volunteer network of people ages 55 and over. Join RSVP and you join nearly 500,000 volunteers across the country who are tackling tough issues in their communities. With RSVP, volunteers receive pre-service orientation, training from the organization where you serve, and supplemental insurance while on duty. RSVP offers a full range of volunteer opportunities with thousands of local and national organizations. For example, you may: Mobilize other volunteers, mentor or tutor children, share legal or financial expertise, assist victims of natural disasters, clean up the environment, beadwork, quilting, Lakota arts, and more. The Foster Grandparent Program allows people 55 or older to share their love, time and experience, and help children who need it. As a Foster Grandparent, you are a role model, a mentor and a friend. You may: Help children learn to read, provide one-on-one tutoring, guide children at a critical time in their lives and give the kind of comfort and love that sets a child on the path toward a successful future. Foster Grandparents serve up to 40 hours per week at schools, non-profit child care centers, and Head Start centers. Some volunteers may qualify to earn a tax-free, hourly stipend. You will receive pre-service orientation, training from the organization where you serve, and supplemental accident and liability insurance while on duty.